Raimundo 660 MIDI Guitar. Classical guitar with MIDI. 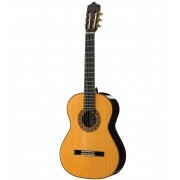 Grand classical guitar with cutaway and RMC-Polydrive IV MIDI system. 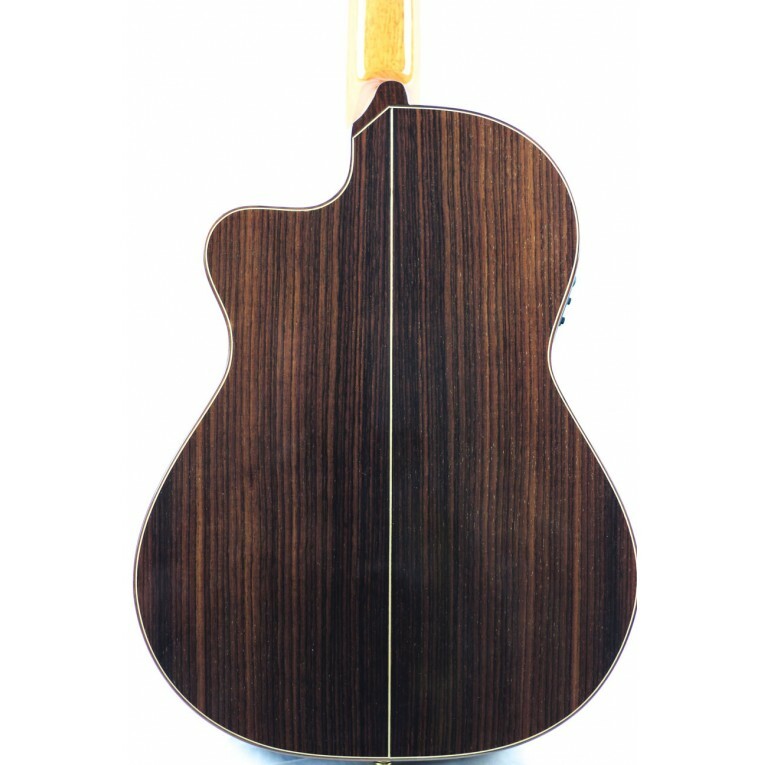 An all solid-woods classical guitar with cutaway and the best available MIDI system installed at the Raimundo workshop. 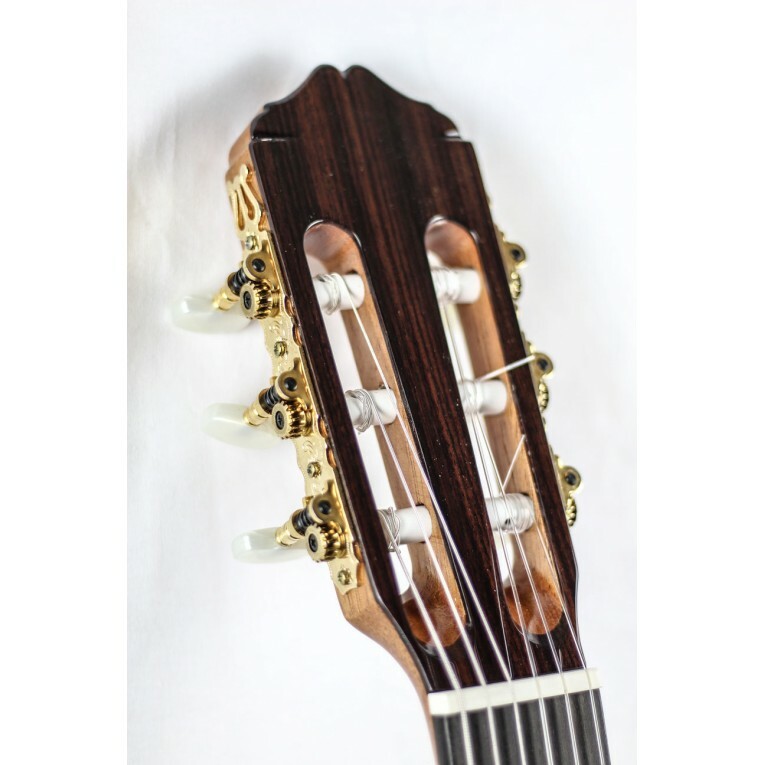 The Raimundo 660 MIDI features a solid cedar top or solid spruce top, solid rosewood body, ebony fingerboard over cedar neck and gold-plated luxury tuners. The RMC Polydrive IV is possibly the most advanced MIDI system for a nylon guitar on the market: a 6-channel polyphonic preamp with 3-band equalizer and guitar/synth controls. RMC-Polydrive IV MIDI-System: 6-channel polyphonic preamp with 3-band equalizer and guitar/synth controls.The Polyphonic section of the preamp buffers the separate string signals and routes them separately to the POLY OUT jack. The separate string signals are also combined in the 'DMX' feedback elimination circuit which produces a mono instrument signal. The mono signal is then equalized, passed through the INSTR. VOLUME control, buffered with a low-output impedance Line Driver and fed to both the MONO OUT and the POLY OUT jacks. 3-Band EQ with Mid-Frequency Select switch, 'DMX' Acoustic Feedback elimination circuitry. Synth Volume and SW1 & SW2 Synth Mode Selectors. Excellent synth tracking and dynamic response. Compatible with all current Guitar to MIDI converters. Two output jacks: 13-pin DIN and 1/4" phone. Works on single internal 9V battery or phantom power. Studio Quality performance 90 dB S/N typical.